Sharon White, Apprenticeship specialist at Watson Martin will present at Learning Technologies exhibition on 13 – 14 February at London’s ExCel. 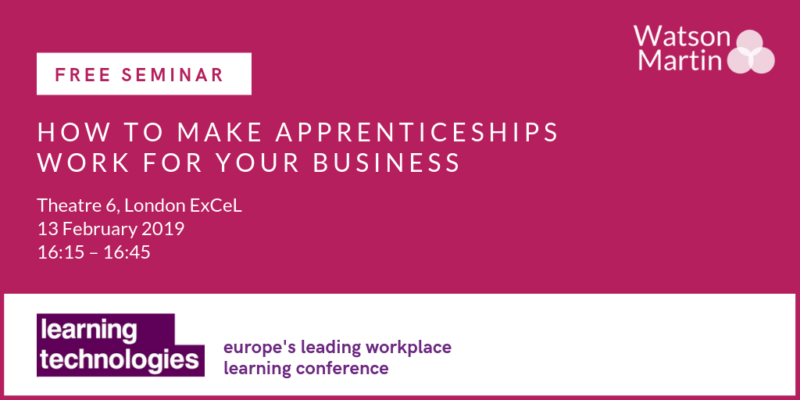 The free seminar session will focus on how to make the most of the opportunities offered by Apprenticeships to develop a talented, motivated and qualified workforce, ensuring that employers get the best possible ROI from the levy. As a RoATP* provider, Watson Martin is already delivering HR Apprenticeship programmes to cohorts from levy paying organisations and in collaboration with other training providers. Sharon White, who manages the programmes with Watson Martin’s Director Heather Watson, will explain how Apprenticeships can transform your organisation’s talent into future leaders at the event. Apprenticeships are a productive way to help grow a sustainable workforce but understanding how they work along with the benefits and risks involved can be complex. While the Government is committed to growing the number of quality Apprenticeships through the Apprenticeship levy, there are bureaucratic processes in place and jargon to wade through which can be off putting to employers. With more than 8,500 visitors and an exhibition hall packed with the latest innovations and best practice in the L&D field, Learning Technologies provides an ideal platform for Watson Martin to showcase how Apprenticeships can help organisations develop a talented, motivated and qualified workforce. It is not only school leavers and young people who can benefit from Apprenticeships. People of all ages can apply and the good news for employers is that Apprenticeship funding can be used to upskill existing staff as well as new recruits. “All the available data indicates that investing in Apprenticeships improves staff retention, loyalty and job satisfaction. Apprenticeships really do create a win win situation for everyone,” Sharon added. Watson Martin, on stand K06, has been delivering high quality learning through Apprenticeships, CIPD Qualifications and In-Company Courses to countless learners from around the country for over 15 years, offering a unique range of flexible mixed mode delivery methods along with the widest choice of CIPD optional modules and units of any centre.